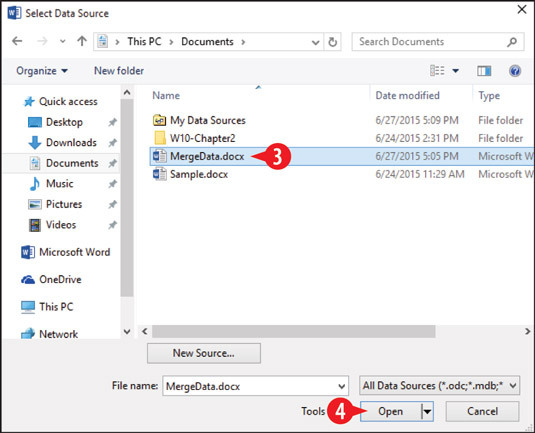 After you choose the main document type in Microsoft Office, you next choose the data list. 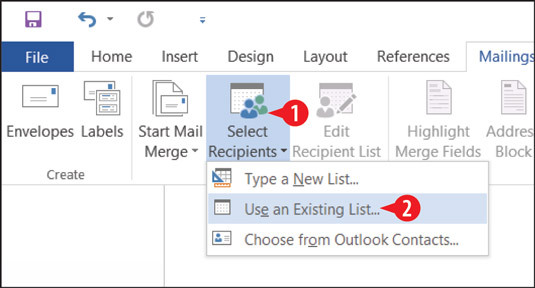 A data list must be in a structured format, such as a Word document containing a table, an Excel workbook, or a database such as the Contacts list in Outlook. If you plan on using an existing Word or Excel file, it’s important to set it up beforehand. You might need to open that file separately to prepare it. Make sure that there is nothing above the table in the document file. The first row of the table must contain the field names (column labels). All the rest of the rows must contain the data records. A Word table suitable for use as a mail merge data list. Row 1 must contain the field names (column labels). All contiguous rows below row 1contain the data records. An Excel worksheet suitable for use as a mail merge data list. Click Use an Existing List. Choose to use an existing list. Navigate to the location containing your data file and select it. Congratulations, your data file is now attached. You won’t notice anything different yet, though, because you must insert merge fields.